As an understanding of computers and programming is an increasingly important aspect of science literacy today, RESET initiated a program in 2017 designed to teach elementary school students computer science through a series of unplugged activities and hands-on coding. The goal is to introduce students to computational thinking—the fundamental principles on which computers and networks operate. The curriculum for this program was developed by Shaheen using resources available through nonprofits Code.org and CSunplugged.org, which are dedicated to spreading computer science education to students in grades K–12. Lessons align to all relevant computer science standards, as well as to the International Society for Technology in Education (ISTE) standards. They also reinforce concepts and skills taught in other subject areas by integrating national math, English language arts and science standards. Computer science principles used in these lessons can be found in the NGSS (Next Generation Science Standards) Science and Engineering Practices, which include developing and using models and using mathematics and computational thinking. 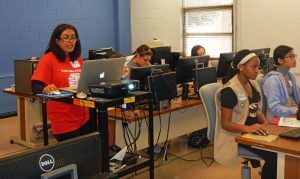 Volunteers for this new program have been recruited from sites such as Code.org and the DC STEM Network.